I look forward to participating in the trial myself once it becomes public. 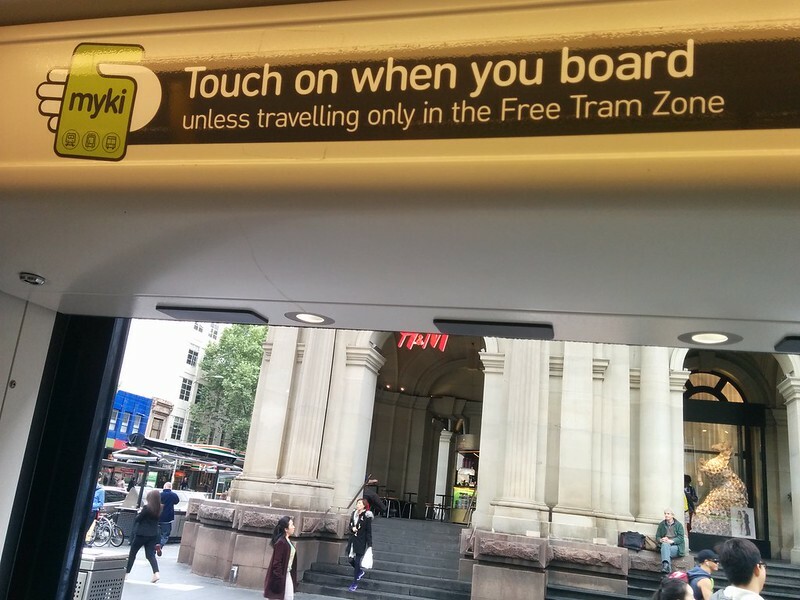 I do wander how they will check the mykis and make sure you’ve touched on with the myki app. I look forward to the AOs opinion and how they will manage it. Would be nice if they had it a closed beta that users who choose to can apply I personally would love to test it and don’t mind if it is broken/buggy as I would have my regular card as a backup. The phone also needs to have credit, have a battery that’s not flat, have a (reasonably) current operating.system, be in range of a tower with the right carrier….. The app could run offline as a backup, basically how the current Myki cards run where the reader does the work and the phone just emulates a real card. I see the next evolution to ticketing being a completely open station no barriers no ticket readers where cameras are present arround the station that know who everyone is and bills to a account this probably won’t be a thing for the forseeable future. Similar to how Jaywalking in China has been cracked down on. 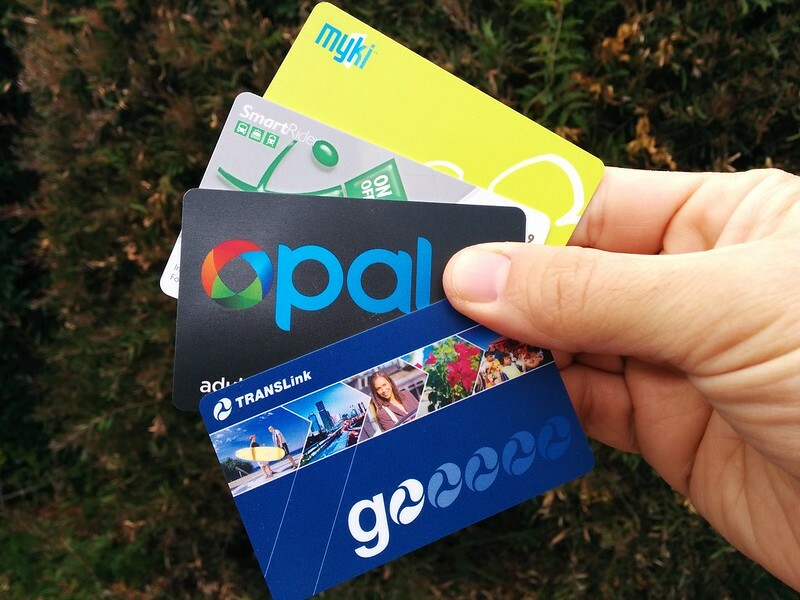 Since Myki is a stored value card, once you start using it as a phone app that becomes your card. 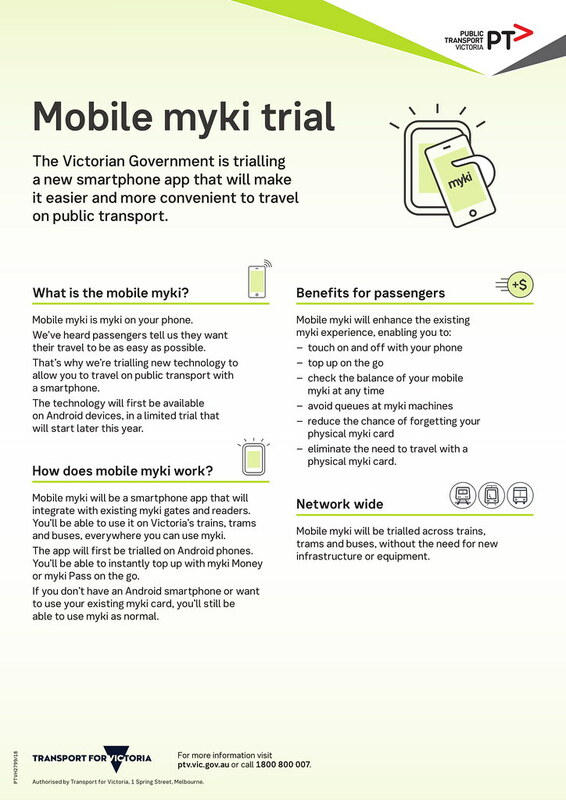 It will simply imitate a Myki card and should not require the phone to connect to mobile data, except when topping up. It’s a clever idea, but the main disadvantage is that your phone has to be charged at all times. Barry and Thomas are right. Once set up, it would act like a card. No need for a mobile connection, and theoretically, no need for any special arrangements for AOs to check the phone. These days though there’s a huge number of people who keep their phone with them and charged at all times. But yes, there is a risk of the battery going flat when you need it. The other question is: do you need to open the app to touch-on, or can the phone activate it when detecting that a compatible NFC device is nearby? I believe this is possible – apps such as Taginfo can wake up if an NFC card is presented, for instance. Regarding ticket inspectors, I presume (and this is entirely presumption), that the first instance would be checking your phone’s NFC in the way that a Myki is checked. If you stated that you had tagged on with a working phone but your phone was defective in some way (flat battery, for example, but possibly dropped or otherwise broken) they would ask your phone number, which you would have entered when you downloaded their app. They could then verify your travel, either in person or later in conjunction with you providing valid ID. If you tagged on with a working phone but were unable to tag off because your battery had died, you would presumably be given the full fare for that service, in the same way as if you had not tagged off with a Myki. Again this is all speculation but it seems fairly straightforward to run this system similarly to Myki. While it is true that not all android phones have NFC, it has been common in the higher end phones. e.g Samsung Galaxy S2 came out in 2011 with NFC. Note also that because of the way payment cards work in many countries in ASIA, most of the cheaper phones have NFC since 2013-4, and effectively all since 2016. There will be people who did not know they had NFC on older phones because it was not necessarily switched on, or was hidden. Most people will just need to click on an icon in settings. There will be some people who have switched off automatic software updates.. but may now need to do so to get NFC active. Basically, if you have an Android phone that accesses the 4G network, ( which rolled out 2014 onward) your phone almost certainly has NFC. Also.. when your phone says it is out of power, it is not really out of power. It still has power for 12-24 hours for basic functions ( like clock, OS etc). So your phone will work like a card for up to about 10 NFC transactions even if it is low battery or out of power. Note that things like Samsung Pay and Android pay require fingerprint or pin, need an app, so need enough power to run the phone. I am guessing that the Myki app- because of the relatively low dollar value individual transactions will not need that. Well, I guess anything that makes fares easier to pay is “good”, but let’s face it, you still have to have a Myki account. As you say, where we should be getting to is payment by contactless credit card. You mention that this works well in London, especially for visitors, who don’t have to set anything up – as soon as they arrive, they can just flash their credit card at the reader, and they’re all set. Whereas, here in Australia, there’s a different system in every city. I’d love this though I doubt I’ll be using it soon as I’m still holding on to my non-NFC mobile phone. However, I wish PTV would push out that trial of the Paypass-only Myki topup machine into general use. I’ve asked them if they ever will, but I’m not getting any answers. @Gregory Fisher, I’m using the Galaxy S2 and it doesn’t have NFC. Though there was another model sold by Telstra, maybe that one has it? Also I wonder if it’ll work in conjunction with an existing Myki card. If my phone battery has gone flat or if I left my phone at home, and I have a pass on the myki, I wonder if I can pull out the Myki from my wallet instead. If the mobile app is developed properly, the need to tap on with credit cards will be moot for most users. Rumours suggest that NFC will be unlocked in iOS 12 this year, but Suica cards are already usable on iPhones. In my experience with Suica, the iPhone doesn’t need to be unlocked or authenticated when touching on at the gate. In addition, the Suica app allows topping up using Apple Pay, so there’s no need to add your credit card details if you don’t want to. The myki app should allow a similar functionality with the Android/Samsung/Apple Pay to make the app easier to use, especially for foreign visitors. Also, what about multiple cards? On a family outing, you might have a card for yourself and a few more cards for children. You should be able to touch on with each of these cards. I’d take the opposite view on this. NFC isn’t likely to be supported by iOS for payments like this any time soon (if ever), and potentially only a small % of Android users will have NFC and be prepared to install this app and set it up. Extra options are good, but this does add complexity to signage, help guides online, staff training, plus the ongoing cost of maintaining another app. Time and money is better spent elsewhere, with a focus on getting contactless payments right IMO. PTV doesn’t have unlimited resources, and my concern is this will take far more time and effort than they realise now, taking away time and people that could be used in planning a contactless upgrade. @Arfman For the galaxy s2 NFC was activated with the Android 4.0 update by Samsung from March 2012. The NFC antenna is flat mounted on the battery behind ths black samsung sticker and warning. Australia was a territory that had the S2 shipped an nfc equipped battery but without nfc activated. Unless you have replaced the battery with a no your name brand without an antenna, or your phone is a was originally intended for sale in one of the very few territories where a non nfc battery was used, then you will be able to use nfc. My point stands though re timeline for nfc on android.The vast majority of android users in Australia have nfc, even those using cheaper phones (since 2016) or flagship phones (since 2012). That is about the Chip not the payment system. You can already go to bunnings and buy a samsung nfc compatible door lock which can be set up wth any android phone. I know I’m digressing from the main topic but on this, mine has no such attachment. It has just the replaceable battery and plastic cover. If I recall correctly, there were two models, the i9100 on Optus and Virgin (and maybe a few other providers) and the i9100T for Tesltra. Telstra had to spec their own because the NextG uses frequencies that not optimised on the plain i9100. @Gregory, it’d be interesting to see some figures around the number of Android phones with NFC. One of my sons has a Motorola G4 Plus bought in 2016. No NFC in that, though my G5 Plus certainly has it (I specifically wanted it, having seen how handy it was for checking NSW Opal and Singapore Ezilink smartcard balances). It is madness to not include credit cards in this. The example at the end is fantastic and what I have been demanding for years. ie, a credit card does not know if I am travelling 5 days per week or just 1 day per week. Myki money will cost me $172 per month and Myki pass will cost me $145/month. If I travel with a credit card 5 days per week, it should only cost me $145/month. Motorola is Lenovo. By the beginning of 2016 it had less than 1.1% global market share. I can’t give you Aus market share. Lenovo refocussed Motorola on android only. The G4 plus was praised generally, but highly criticized because as a budget or value smartphone it did not have NFC while all its competitors did. Global market share. of the entire g4 range was 0.27%. There are lots of lists of mobile phones with NFC.. but most of these stopped being updated in 2016 because NFC effectively is a standard feature. Roymorgan research 91% of teenagers have mobile phones. There is no “free” stats on overall phone fleet age in Australia. Widely reported replacement cycle of smartphones in 2016 was about 22 months. in 2018 it appears to be about 25 months. According to Device Atlas in 2016 appox 33% of phones were 2016; 25% were 2015; 23% were 2014; 8% were 2013. So 91% under 4 years old. Yes there are some android phones that sell outright in the $80-$130 range that do not have NFC. But there are also NFC enabled phones in that price range e.g. Samsung J3; HTC One (M7). But market share of these is tiny. In summary. Vast majority of people have smartphones. Majority of these are android. Vast majority of these will be new enough to have NFC as standard. Absolutely agree with Greg. The percentage of phones with NFC is high in mid-2018. By the time this is adopted in late 2019 it will be even higher, much closer to 100%. Judging by the way things are moving, the days of having physical credit cards are numbered. While it’s a bummer that myki won’t be configured to work with contactless credit cards at this stage, I don’t see that as being a real issue beyond the medium term. Oyster enabled contactless credit card payments back in 2014. The technology landscape was very different back then as NFC was only just creeping into the mainstream. Last phone comment because we have drifted way of topic. I am not a phone guru and I do not work for a phone company. And I know that not everyone can afford to buy a phone upfront. When buying a phone alway check the full specs. Telstra are switching off 3G as early as 2020. Buying a cheap android phone is about future proofing. If I was looking for a cheap android with NFC I would probably buy either a refurbished Samsung Galaxy S5 for around $159..Because its 4G; and you will keep getting firmware updates etc; and get access to andriod pay. ; or preferably a refurbished galaxy s6 for around $199 because you also get access to samsung pay. Both phones had big market share and are still in wide use and are popular hand me down phones. And then get prepaid monthly from a a provider like Amaysim ( or any other virtual network highly rated by Cannex or Choice). It works out much cheaper (starting at $10 per month unlimited with 2.5gb data) and is much more flexible. Hmm… When it says Network is that just referring to the Suburban network? or is it referring to all the network. (E.G Metro Trains, Yarra Trams, Suburban Bus, V/LIne trains in the Commuter Belt (Ballarat, Bendigo, Geelong, Traralgon, Seymour) and Myki-Enabled Regional bus service)? I saw recently that Sydney passengers can now use their Fitbit watches to touch on and off in place of their Opal cards. This sounds like a real game changer to me, as I use my Fitbit for tap and go payments and it is so convenient, and I can see for busy commuters or shoppers, not having to dive into your pockets or fumble through your wallet, is a real bonus. I also think much quicker throughput of passengers, just passing their wrist over the reader, as they enter or exit the platform. The other advantage is security; very hard to lose or misplace your watch, and when you do remove the watch fro your wrist, it is automatically disabled and requires a pin to reactivate. I wonder if PTV is looking at watches as well? I think it won’t be the device.. just they payment system and NFC. Your fitbit (indeed any tizen or android device) creates either a samsung pay or google pay faux visa or m/c card linked to your real debit or credit card account. apple pay works slightly differently..more expensively to providers. whoops. left left pebble/fitbitos and fitbitpay off my last post.Works the same way. Thanks for the info Greg, so does that mean any suitable watch with Android Wear or Wear OS as it now called, or Fibit OS, would be suitable as long as the NFC is activated and there is the Myki app for that OS? My understanding is that if your android phone recognises your fitbit as a payment device, it will work. It may not work independent of you having your android phone with you, but that would have to be an active choice by the developers. I can see why the myki developers are opting to funnel their resources into a myki app that presents your phone as a myki rather than as a credit card. Implementing NFC payments from credit cards would’ve made sense back in 2012 when NFC was rare in mobiles. But today, it’s very common for phones to have NFC built in. There are things you could do with a myki app that you couldn’t do with a credit card (or using a phone as a credit card). Passes? Concessions? Special fares? Refunds?